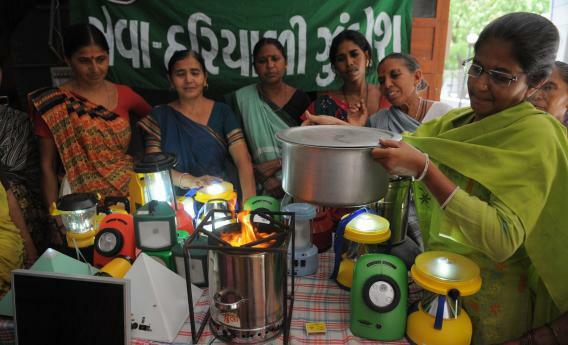 An instructor for the Self-Employed Women’s Association (SEWA) displays a variety of solar lanterns and clean cooking stoves that run on solar panels in Ahmedabad on June 5. As rapidly as solar-power technology is advancing, it seems to be playing an endless game of catch-up to fossil fuels in terms of generating affordable electricity on a mass scale. Just as solar was starting to become competitive with coal for some purposes, along came fracking to make natural gas even cheaper. Solar still has not been able to shed its rap as an expensive “green alternative” to traditional energy sources, and startups that were betting on it to do so have been dropping like flies lately. But the gloom shrouding the “solar power industry” shouldn’t obscure the cool and clever ways in which solar energy is increasingly being used to make life easier and more efficient, often on a small scale. A post on the New York Times’ India Ink blog today provides a great example. The New Dehli-based nonprofit TERI, The Energy and Resources Institute, has been working on a project to make solar lanterns available to India’s poor. It’s an application that capitalizes on what’s unique about solar power—it’s available every day, to everyone, for free. The trick is harnessing it cheaply and efficiently, and researchers are getting better at that all the time. Within the foreseeable future, solar power might not only give us nightlights in a blackout, but keep our gadgets running and our beer cold to boot.